The Revolution&apos;s Cristian Penilla (center) celebrates his second goal of the game on Saturday night at Gillette Stadium. 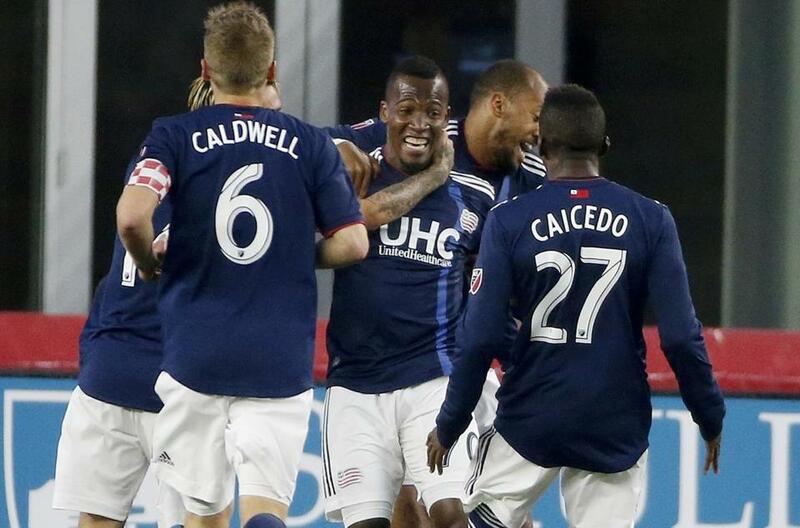 FOXBOROUGH — Cristian Penilla provided the Revolution with a dream start Saturday night, scoring twice in the opening seven minutes against Toronto FC. Even though its frontline wreaked havoc on TFC’s backline for most of the first half, New England needed goalkeeper Matt Turner to come to the rescue in a 3-2 victory in front of 19,596 at Gillette Stadium. TFC’s Tosaint Ricketts sent Turner sprawling to his left from close range in the 25th minute, and the rookie goalkeeper tipped away a dangerous cross moments later to keep the visitors at bay before an own goal slipped past him in the 54th minute. But before Turner was called into action, the Revolution sent two shots past his counterpart. In the fourth minute, midfielder Scott Caldwell intercepted a Michael Bradley pass near midfield and directed it into forward Teal Bunbury’s path. Bunbury helped it on to Penilla, who drove toward TFC’s goal. Penilla buried his shot into the bottom left corner beyond goalkeeper Alex Bono’s outstretched arms to give the Revolution a 1-0 lead. Penilla doubled his tally — and the Revolution’s lead — three minutes later after Diego Fagundez’s pressure forced Bono to step forward after receiving a back pass. He dribbled to the top of the penalty box and laid the ball off to Ager Aketxe. But the midfielder’s one-touch pass went directly to Penilla. He took a quick touch and clipped the ball beyond Bono, who couldn’t scramble back to his goal in time. Before the game, Friedel implored the Revolution to press a TFC backline that likes to pass out of the back, and the home side capitalized. The Revolution squandered opportunities to add to their lead, and they needed Turner to preserve their cushion. But New England (5-3-2, 17 points) followed its blazing start to the first half with a vital third goal only one minute into the second half. Right back Andrew Farrell’s clearance found Bunbury on the right wing. He controlled the pass, turned, and shrugged off a challenge from Aketxe before firing it past Bono, handing the Revolution a 3-0 lead. After the Revolution added their third, the visitors worked their way back into the game. TFC (2-6-1, 7 points) pulled one back in the 54th minute on Revolution center back Antonio Mlinar Delamea’s own goal, and substitute Sebastian Giovinco threatened Turner’s net shortly after entering in the 60th minute. Giovinco cut the Revolution’s lead to one when he slid an 89th-minute penalty kick past Turner. But before returning to midfield for the restart, Giovinco exchanged words with Revolution midfielder Wilfried Zahibo and shoved him in the face. After a stoppage for video confirmation, Giovinco was shown a straight red card. New England returns to action at home against the Columbus Crew on May 19. Fagundez, who received his fifth yellow card of the season in the 73rd minute, will serve a one-match suspension for yellow-card accumulation.